Ukrainians are back on the streets nine years after the Orange Revolution - voicing similar aims but with a hardened sense of reality. What a sense of deja vu! Hundreds of protesters lie on the floor in sleeping bags, eating and chatting in the opulent conference hall of Kiev city council - just as they did nine years ago. But things have changed, as this time people did not wait for the city administration to open its doors voluntarily. Instead, they stormed the building on Sunday, broke a few windows and occupied the ground floor. In 2004-2005 mass protests lasting for two months - the Orange Revolution - helped bring to power pro-Western President Viktor Yushchenko, who defeated his rival Viktor Yanukovych in a repeat run-off election. Now Mr Yanukovych, who took his revenge and was elected president in 2010, faces a wave of protests against his rule - the biggest since the Orange Revolution. The mass demonstrations were triggered by his government's decision not to sign a wide-ranging association agreement with the European Union, because of pressure from Russia. Despite several clashes with police, which left dozens of people injured, the general mood of the protesters is rather peaceful. But you see almost no children on the streets of central Kiev, and many demonstrators wear plastic helmets and gas masks. That is miles away from the romantic feeling of the Orange Revolution. Yet some of the key anti-Yanukovych slogans are still there: "Out with the gang!" and "Out with the con!" The last refers to two alleged criminal convictions dating back to Mr Yanukovych's youth - convictions not documented in any official records. Another major difference is the conspicuous presence of nationalist activists among the demonstrators. On the streets of Kiev, far-right youths in black balaclavas instruct volunteers to resist the riot police, and organise security shifts in the barricaded Independence Square. Some of them are dedicated supporters of the ultra-nationalist Svoboda (Freedom) party, which is one of three opposition forces in parliament. Another two parties involved in the protests are Fatherland, of the imprisoned former Prime Minister, Yulia Tymoshenko, and Udar (Punch), led by heavyweight world boxing champion Vitali Klitschko. None of them seems to enjoy the full trust of the demonstrators - unlike 2004, when Mr Yushchenko's name became the main slogan of the Orange Revolution. That is why the new protests are sometimes described as "horizontal", rather than top-down, and truly social. "Today politics is conducted not in the Verkhovna Rada (parliament) or in the cabinet, but here, on the square," said Yuriy Lutsenko, a former "Orange" interior minister. A former ally of Mr Yushchenko, he spent more than a year in jail after Mr Yanukovych came to power. His trial was widely seen as political by the Western powers. "Something has changed, and in the right direction. You have understood one thing. 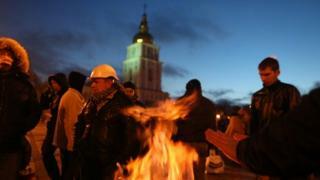 It is not the president who must be replaced, but the whole system," Mr Lutsenko told the protesters in central Kiev. That raises a key issue for the opposition leaders: how exactly to change the system legitimately? Social networks are full of images and videos of riot police beating demonstrators and journalists. And there are no signs that the security forces are prepared to side with the protesters. The majority of MPs still back the president. In parliament, they defeated an opposition attempt to dismiss the government on Tuesday. They also reject demands to hold early presidential and parliamentary elections. As temperatures are falling below zero, demonstrating on the streets is becoming more and more challenging. More wood is needed for the fires to warm those manning the barricades, as more people come to Kiev from different parts of the country, to join the "Eurorevolution".